When Alfred Jarry wrote his interpretation of Jesus’ crucifixion it must have seemed a neat metaphor: the self-imposed yet stage-managed torture of the hill-climb is an apposite image to evoke self-sacrifice. Jarry also accentuates the technical and media-saturated aspect of this crucifixion: the crown of thorns becomes an advert for a puncture proof tire. Of course, what with Lady Gaga, Madonna and Lloyd-Webber, the representation and artistic co-option of religious themes has become so commonplace as to evoke ennui; although of course some can still get overheated by a Piss Christ or Jerry Springer the Opera. As the juggernaut reaches ever closer to Armstrong and his cohorts and facilitators we seem to desire a quasi-religious cleansing (or stoning). Jarry’s essay serves to remind us that we should recognise the absurdity of such reactions, their atavism. Cheats and dopers deserve to be punished. But we deserve the same (oh, yes) if we don’t recognise our own complicity in this spectacle of the absurd. 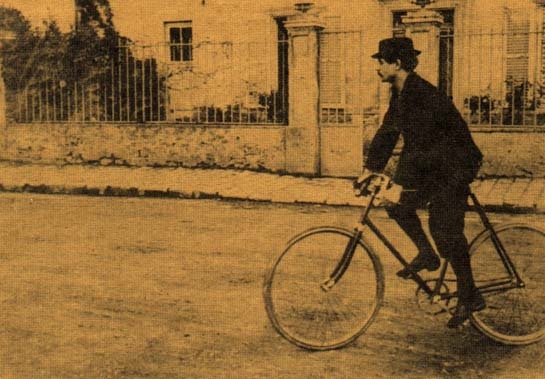 For an antidote visit the wonderful world of Rainer Ganahl, such as this gem of mountain performance (with cowbells): The Passion Considered as an Uphill Bicycle Race or I wanna be Alfred Jarry, 1903 / 2011 or if you don’t have 16 minutes, ALFRED JARRY’S CALL OF NATURE. 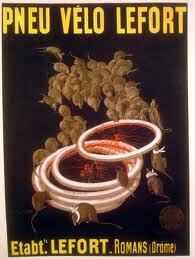 This entry was posted in absurd, art, climbing, doping, France, vintage by spandelles. Bookmark the permalink.